Exeter Chiefs head coach Rob Baxter has said their European Challenge Cup semi-final defeat at Gloucester "hinged around the scrum". The Devon side went down 30-19 against their Premiership rivals at Kingsholm to miss out on the final at Twickenham Stoop. "The truth is the game really hinged around the scrum," Baxter told BBC Radio Devon. "If we managed that slightly differently or a referee saw things differently, things could've changed." Exeter must now concentrate solely on their push for a top-four finish in the league and a place in the play-offs. "The scrum was a frustration for us but we've got to make sure we come through frustrations positively," added Baxter. "We've had a week of everyone talking about Tomas Francis playing for Wales and all that really happens in a week like that is you ramp Gloucester's pack up and the hindsight of it is, now, Tomas looks a little bit more human because he's been penalised in this game." 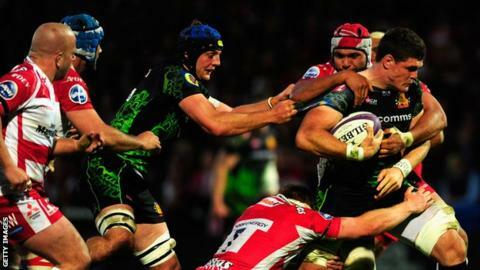 Rob Baxter's side finish their season against Sale but must first play top-half rivals Wasps and Saracens away from home. "We don't need to go away and completely reinvent ourselves. "The rest of the season's still massively exciting for us."